NRC Family Tree Hearing Check if there is any hearing or verification required or not. 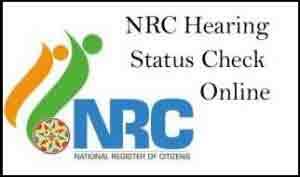 Now you can check if NRC Family Tree Hearing or Gaon Panchayat/Lot Mandal/Circle Officer hearing is required against your ARN, then just go to the NRC Official website http://www.nrcassamhearing.in , then enter your ARN no. which is 21 digits and captcha code, then submit it. We know that the first Part Draft was published on 31st December 2017 with 1.9 crores out of 3.8 crore people. Rest of applicant name was not published due to the unverified document, tree form of the family member or mismatched of some document. So, Now go the official site of NRC Assam which is http://www.nrcassamhearing.in and check if there is any hearing or verification required or not. Note: Dear visitor, it is not a official site .Please go to the official website of NRC Assam for more information.